Christmas in France starts with Advent. It begins on a Sunday four weeks before Christmas. 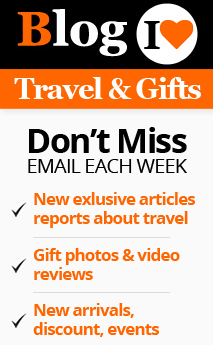 That means they will get four Sundays before Christmas. An advent calendar is set up on the first Sunday to help the children to count down the days till Christmas day. They have to open a window on the calendar on each day. 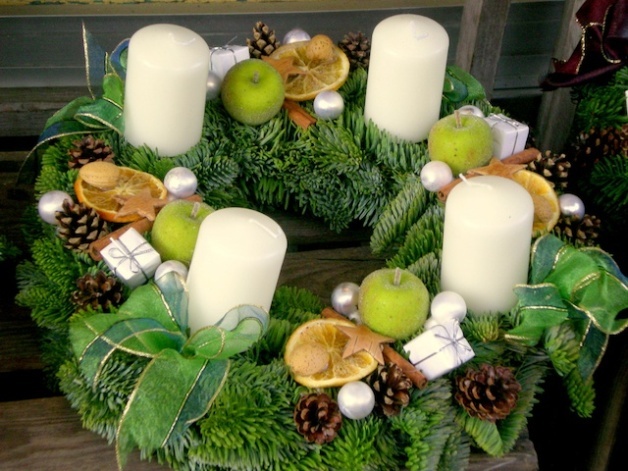 An advent wreath is also made using fir tree or pine tree branches. These trees are used because they do not shed their leaves during winter. So they represent hope and eternal life during the Christmas season. Four candles are placed on the wreath. They will be lighted on Sundays, one on the first Sunday, two on the second Sunday and so on. On the fourth Sunday all the four candles will be lit. The wreath is decorated using flowers, ribbons and other Christmas decoration. Nativity scenes are an integrated part of Christmas. The churches usually put up large nativity scenes using life-sized figures of the holy family, shepherds and the cattle. Some churches go to the extent of creating live nativity scenes using actors and live animals. 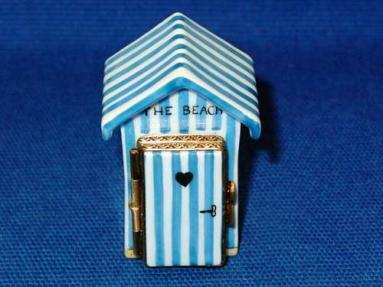 But smaller nativity scenes are installed in houses with small figurines called ‘santons’. 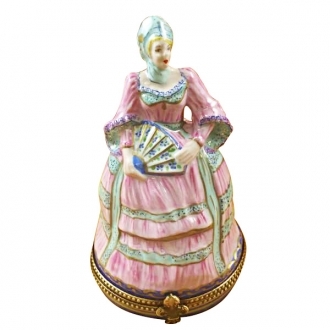 In France these figurines are handcrafted with clay. Christmas markets are set up in towns and cities all around France, from the latter half of November till the end of December. The stalls in these markets offer very happy shopping experiences to their customers. They sell everything needed for the Christmas celebration. Christmas food items and decorations are the principal merchandises here. 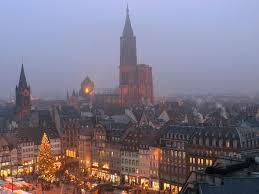 The oldest Christmas market in France is in Strasburg. The market has been in existence during every Christmas season from the 16th century. It is one of the biggest of its kind in France. The market is set around the ancient Cathedral of Strasburg. 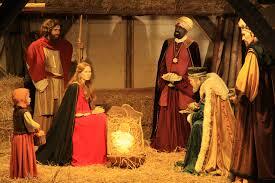 Christmas celebration, as it is now, has started only by the 16th century. The tradition of the Christmas tree also is presumed to have started in 1521 in Alsace. At that time they had decorated the tree with red apples and light bulbs. A fir tree is often used for this. Each house will have one of these trees, decorated to the maximum with tinsel decorations and tiny glass globes. The gift packets meant for the family members will be heaped at the foot of the tree. Hanging a branch of mistletoe above the door is another popular Christmas tradition in France. It is believed that it will bring good luck throughout the following year. In France more gifts are exchanged on the 6th of December, when they celebrate St. Nicholas day than the Christmas day. During the Christmas night, like children all over the world, French children also keep their shoes and hang their socks at the fire place for Father Christmas to reward them for their good deeds with gifts. 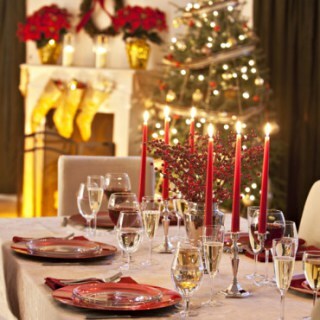 24th December, which is known as the Christmas Eve is the time for family reunions in France. All the family members get together to join in the fabulous dinner on the Christmas Eve. This is called le Réveillon. All the road side eateries will be open throughout the night. They decorate the banquet tables in a grand way. The traditional food items are then served on the table. It includes all the delicacies from roasted turkey and other fowls to oysters and salads. 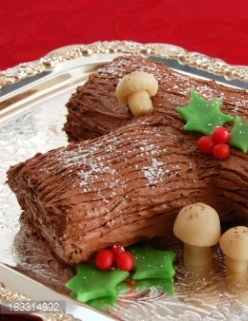 It is rounded off with a special chocolate cake log called bûche de Noël. The luxurious dinner is prolonged for hours. Eating prolonged dinner at tables is a French custom of great social relevance. People go about singing Christmas Carole emulating the groups of shepherds who went around singing to announce the birth of the Holy Child on the night 2000+ years ago. The custom of Christmas Carol singing started only during the middle ages. At that time it was accompanied by a round dance. But in due course it changed to the singing of only a particular kind of songs. The midnight mass is conducted in churches to commemorate the birth of the Infant Jesus. But only the deeply religious people attend this. Christmas day is another day for sumptuous food. Apart from consuming the leftover food from the previous evening, they get together in the relatives’ houses to enjoy yet another luxurious feast. The French celebrate Epiphany on the January 6th. 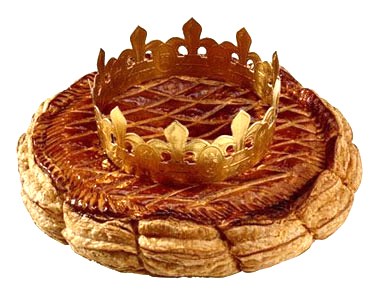 A flat almond cake called ‘Galette des Rois' or ‘King Cake’ is made on that day. The cake will have a miniature crown or a doll, representing Infant Jesus inside and on top of it a paper crown. Whoever gets a piece with the prize will have various privileges. 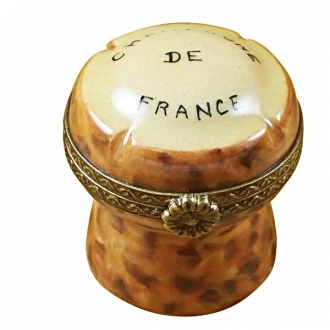 Another peculiar custom in France during the Christmas time is that the public servants will come to collect contributions. The postman or the fire man comes to houses selling the next year’s calendar and collect a good sum of money. Christmas is a season of enjoyment in France. It is a time of hope and expectations for the coming year.